This recently restored house is secluded and detached and offers a beautiful, intimate outdoor space. It is an ideal solution for 4 adults and 2 childeren (6 adults aren't permitted because the two beds on the loft are not suitable for adults). There is also a patio, where you might just sit and eat, enjoying the gorgeous view. There is a swimming pool, at only 50mt., with breath-taking panoramic views on the sorrounding valley from the 700 mt altitude, a shaded loggia area and tended lawns. The surrounding woodlands are rich in flora and fauna. The house is 4 km from the nearest town, where there is a supermarket, and 6 km from Marradi which offers a large variety of shops and services. Marradi hasa railway station and frequent trains into Florence's city centre (1h15mins) and other notable Tuscan towns. Also to Faenza (home of faence pottery, and just 30 km away) and on to Ravenna. If you'd like to spend some time at the seaside as the Adriatic Coast with its beaches -including Rimini and Riccione- is less than an hour's ride away. The road to the house has some curves and from the main street there are 4 km. of steep unpaved road. If you fancy a typical dinner with local dishes to enjoy in the main hall or under the patio just ask us, we'll be happy to book it for you. We advise you not to miss three thematic routes. One traces the Medicis; another follows the Mugello painters (Giotto, Cimabue and Beato Angelico); and the third heads towards Brisighella, Faenza and other medival and Renaissance centres on the way to Ravenna, home of wonderful mosaics. 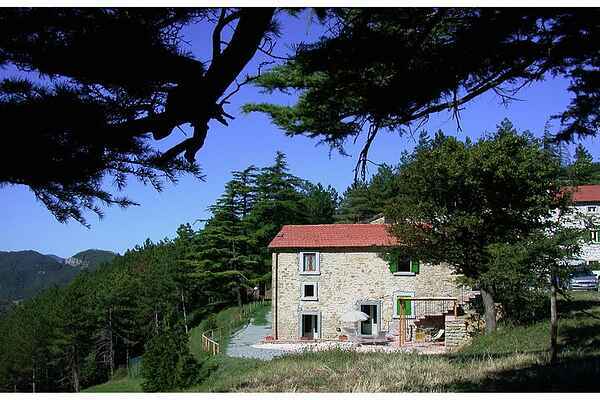 Adventurous guests will appreciate the trekking, cycling and horse-riding trails that reach as far as Gamogna Hermitage, Acquacheta, Trebbana, Passo della Colla and even to Vallombrosa and the Tuscan Maremma. Within 8km are a tennis club and a riding school. We have links with one of the best restaurants of Marradi, where you can savour a local menu. Following the North-Eastern valley you'll reach Lutirano, a small village with a supermarket and just 6 kms afurther there you'll find the enchanting Tredozio, with bakeries, butchers, pizzerie and restaurants, including the famous 'Il Mulino'.